Astronomers at ESO have recently been "Seeing the Light Through the Dark!" Some months ago, the ESO Very Large Telescope (VLT) observed a classical dark globule, Barnard 68 (B68) , in front of a dense star field in the Milky Way band. 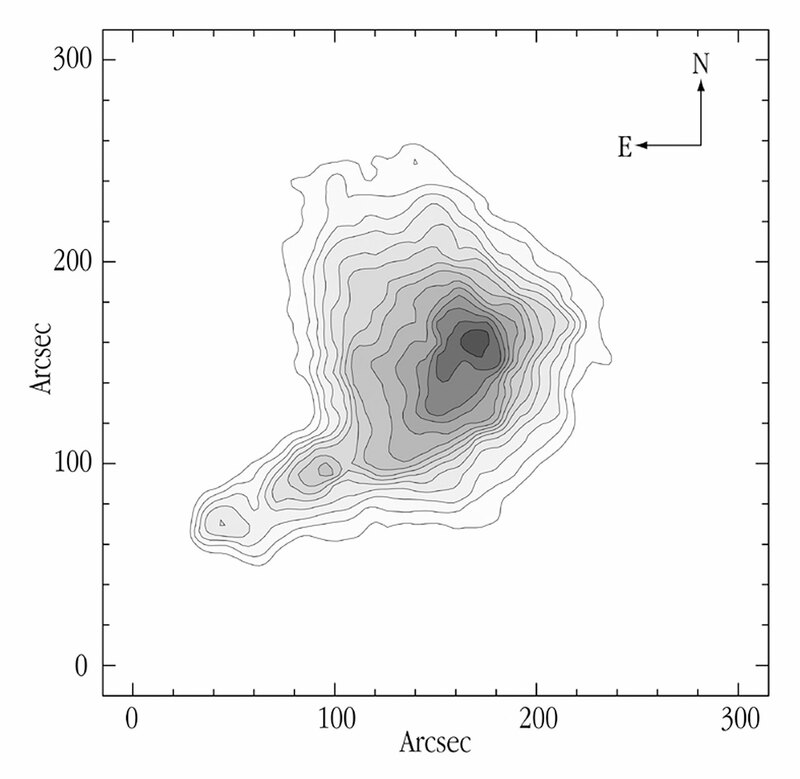 CCD images were obtained in various visual wavebands with the FORS1 multi-mode instrument at the 8.2-m VLT ANTU (UT1). They were combined into a colour photo. This dark cloud is situated at a distance of about 500 light-years (160 pc) towards the southern constellation Ophiuchus (The Serpent-holder). The VLT photo shows it as a compact, opaque and rather sharply defined object, the central parts of which are so dense that they completely block out the light from the stars behind. It is known that clouds like B68 at some moment begin to contract and subsequently transform themselves into normal, hydrogen-burning stars. But how exactly does this happen? And what is going on just now inside B68 ? Is it currently at the beginning of the contraction phase or have stars already been formed? How dense and heavy is it really? Answers to some of these basic questions are now being provided by new and unique observations in the infrared part of the spectrum with the SOFI multi-mode instrument at the ESO 3.5-m New Technology Telescope (NTT) at La Silla. For the first time, it has been possible to look right through even the most opaque regions of such an object and learn what is inside in unsurpassed detail. 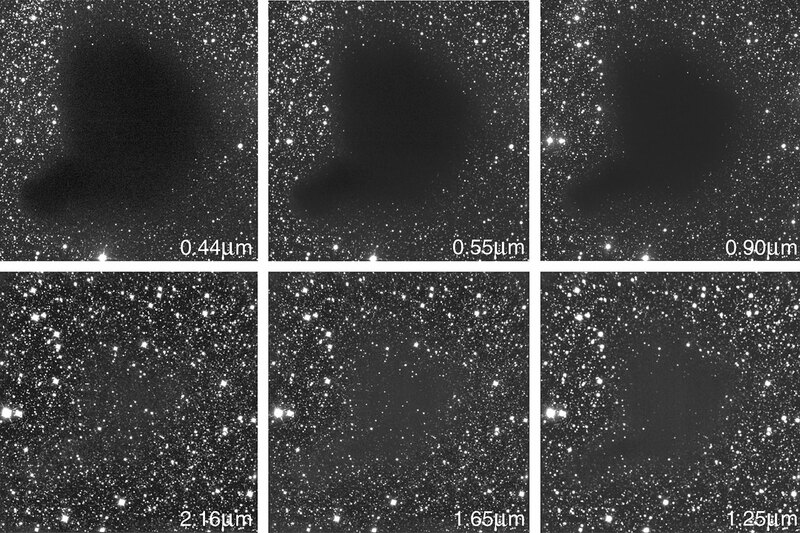 The new near-infrared imaging observations were taken with the SOFI multi-mode instrument at the NTT on La Silla during a spell of excellent observing conditions in March 1999. The measured seeing was about 0.6 arcsec during several hours while these exposures were being made. SOFI (Son OF ISAAC) is a scaled-down copy of ISAAC, the major VLT instrument that has already produced spectacular observations. SOFI is a unique instrument for the study of extended objects like B68 because of its very sensitive infrared detector and unrivalled large field-of-view. About 200 exposures (each lasting about 10 sec) were made in each of the H- and Ks-bands to reach as faint objects as possible; less time was spent in the shorter wavelength J-band. They were then added to produce three frames that form the basis for the subsequent study and which were used to produce the images shown here. Dark clouds are dark because they contain myriads of submicron-sized solid particles - the interstellar dust grains . They also harbour many different species of molecules. They are responsible for the obscuration of light at visible wavelengths. The images and video provide a very direct illustration of the dependence of this obscuration on the wavelength (astronomers speak about "dust extinction"): it is higher at shorter wavelengths than at longer ones. The new data are unique in the sense that it allows astronomers, for the first time , to see through the very centre of a dense molecular cloud, into the cold regions where stars like our Sun will form. We know this because a large number of background stars, not related to the cloud, are seen through the central, most dense regions of B68 in the Ks-image at 2.16 µm. Dark clouds are the coolest objects in the known Universe with temperatures around -263 °C, just ten degrees above the absolute zero. They are the nurseries of stars and planets. To understand them is to understand the processes that took place when the Solar System was formed about 4,500 million years ago. Unfortunately, because they are mostly composed of molecular hydrogen (H 2) and also because they are so cold, 99% of a molecular cloud's mass is virtually undetectable by means of direct observations. A traditional way to study such clouds is by means of observations with radiotelescopes of rare molecules (such as CO, CS and NH 3) that "trace" the molecular hydrogen. However, the analysis of such data is rarely straightforward and a clear and unambiguous interpretation is frequently impossible. Thanks to the recent advent of improved infrared technology, incorporated into SOFI, it will now become possible to study molecular clouds in a more direct way, as illustrated here. By means of careful measurements of the change of colour of background stars seen through a molecular cloud (cf. the "reddening" of the stars near the center of the first image), astronomers can chart the distribution of matter inside these clouds. The new SOFI observations of B68 allow such measurements to be done for the first time through the central, densest regions of a molecular cloud. These unique data provide astronomers with important clues on how a dark cloud transforms itself into stars. The new SOFI images of B68 are now being studied by ESO astronomer João Alves and his collaborators, in particular Charles Lada (Harvard-Smithsonian Center for Astrophysics, Mass., USA) and Elizabeth Lada (University of Florida, USA). Several interesting conclusions can be drawn already. Through careful measurements of the colour of the background stars that are seen through the cloud, it is now possible to determine the total amount of obscuration at the center of the cloud. It turns out to be no less than 35 magnitudes in the V-band at wavelength 0.55 µm. This number corresponds to a dimming of the starlight of a factor of no less than 10 14 ! If, in a thought experiment, a sheet of dust with this high degree of obscuration were placed in front of the Sun, there would be eternal darkness on the Earth. Our central star would then shine with magnitude 9 only, i.e. it would be about 15 times too faint to be observable with the naked eye! An analysis of the map of obscuration shows the detailed distribution of dust within the cloud. The densest part is somewhat to the west (right) of the geometrical center of B68 . It looks as if two smaller areas (to the lower left, i.e. southeast of the center) are detaching themselves from the rest of the cloud. The small-scale structure of B68 seems to be very smooth and homogeneous. The SOFI observations rule out the presence of "clumpy" structures inside the cloud, on nearly all scales. The new data clearly show that B68 is now in the very early phase of collapse, on its way towards star formation . The duration of such a stage is relatively short, of the order of 100,000 years, and to catch a cloud in this phase is likely to be a rare occurrence. If the collapse had been going on for a little longer, it would not have been possible to see through this cloud today, since the obscuration would then have been much higher, of the order of hundreds of magnitudes. Moreover, the observed distribution of matter inside B68 provides us a first glimpse of how nature begins to form stars. These outstanding observations will now be used to test current theories of protostellar collapse. 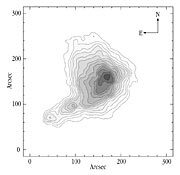 The total mass of the dust in B68 can be determined quite accurately from the obscuration map by adding over the entire area of the cloud. It comes to about 0.03 solar mass. If the gas-to-dust ratio in B68 is what is normally assumed, about 100, then the total mass of this cloud is about 3 solar masses. Accordingly, only a few stars will eventually form in this cloud. After this first, impressive demonstration of what is now possible in this exciting research field with top-class astronomical instruments, other clouds will be studied in the near future, with SOFI and ISAAC. With more data from more clouds, it will soon be possible to comprehend their elusive nature in much greater detail and to characterize the fundamental mechanisms that trigger star formation. 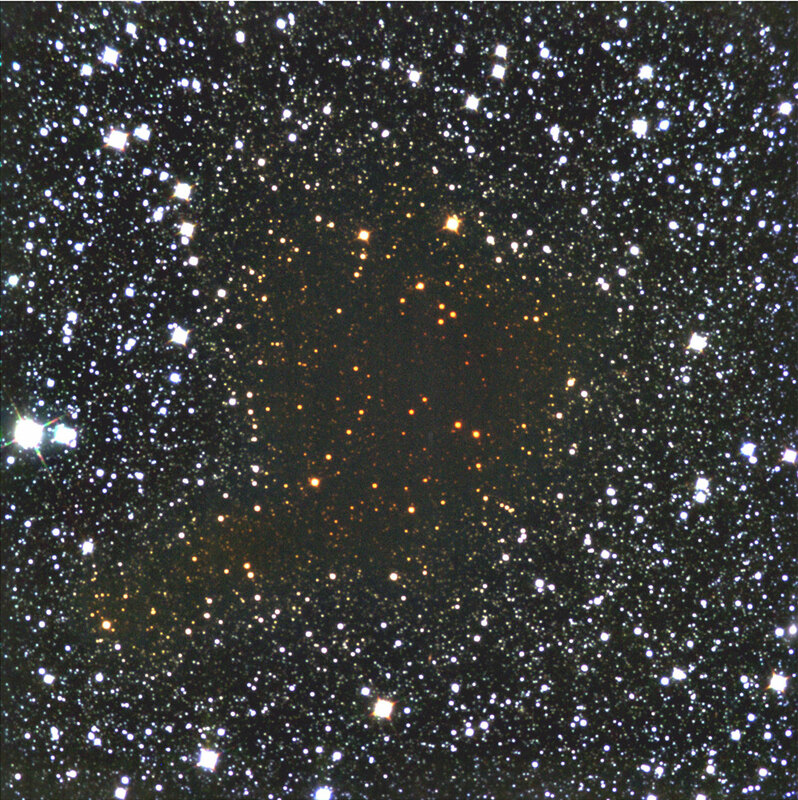 eso9934a : False-colour, infrared composite photo of the dark cloud Barnard 68, obtained on March 8-9, 1999, with the SOFI instrument at the ESO 3.5-m New Technology Telescope (NTT) at La Silla. Three exposures were made through J- (wavelength 1.25 µm - 3 min; here colour-coded as "blue"), H- (1.65 µm - 30 min; "green") and Ks-filters (2.16 µm - 30 min; "red"), respectively. 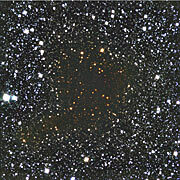 The "reddening" of the background stars that are seen through the cloud is very obvious. It is due to the larger obscuration in shorter wavebands. The sky field measures about 4.9 x 4.9 arcmin 2 (1024x1024 pixels). A slight mismatch between the individual frames is present in the upper corners; this is caused by atmospheric effects. The pixel size is 0.29/arcsec. North is up and East is left.